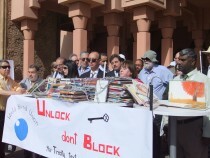 WBUMarrakesh, Morocco – Yesterday, under a scorching sun, the World Blind Union organised an event to raise awareness about the negotiations taking place inside the Marrakesh Palais des Congrès. Behind them, in the building, negotiators have been at work for a week in an effort to agree and adopt a treaty to provide visually impaired people with a broader access to books. http://www.ip-watch.org/2013/06/24/wipo-negotiators-reach-breakthrough-on-3-step-test-in-treaty-for-blind IPW, WIPO, 24 June 2013). The diplomatic conference of the World Intellectual Property Organization is taking place from 17-28 June in Marrakesh. A pile of books on a table all chained together symbolically represented the lock on the access to special format works for blind and print-disabled people around the world. The treaty is seeking to address in particular the current barriers to the cross-border exchange of these books. Maryanne Diamond, immediate past president of the World Blind Union, called for a meaningful treaty. Taking as an example the 198 books chained on the table, and only two unchained, she said this was the current situation of the “book famine” for blind and visually impaired people in the world. She urged delegates to remember for whom they are negotiating a treaty. She said delegates should start agreeing on remaining issues, such as enabling the direct distribution to individuals of special format works, and to ban commercial availability from the text. Fred Schroeder, first vice-president of the World Blind Union, said that according to UNICEF, 98 percent of children with disabilities in developing countries do not have access to education, or access to employment as adults. The majority of blind people and visually impaired live in poverty, isolation, and suffer from unemployment, not because of lack of ability or willingness to go out and work hard, but for lack of access to basic tools, such as literacy. He called on delegates not to only solve technical issues but support a practical implementation that will put books in the hands of blind children and adults worldwide. Jace Nair, from the African Union of the Blind, said the book famine affects Africa very seriously, and made an appeal to the international community to negotiate a 21st century solution to technological access to information and knowledge, rather than negotiating a 19th century treaty that would not serve the needs of users in Africa. Fatem-Zohra Taifor, a visually impaired individual from Morocco, also called for a treaty that will allow a greater access to books, attesting to her many difficulties throughout her childhood, being thirsty for books and unable to quench this thirst from her early years. She talked about a young life deprived of the world of stories, adventure and evasion that could have been provided by books. During her university years, she said, she needed help to go to the library, help to choose her books, help to record them, and to transcribe them into Braille. “I spent so much time doing this that I forgot what the notion of reading for pleasure meant,” she said. to access books, she said, even to prepare for her courses (she is a professor). She called for countries to devise a clear treaty, without grey areas and clauses such as commercial availability so that it can enable equal access to reading for all people of the world.